Today I fixed the sprinkler system. This file was originally mailed to the members of the Island Mountain Ramblers, in 1979. This file was originally mailed to the members of the Island Mountain Ramblers, in 1978.
note: careful attention has been given to preserving the original text. In many cases, this means preserving typographical and spelling errors. — May 6, 2018 Thank you to Carol Dupuis for transcribing this document. Having spent Xmas week on the Plateau, I skied out for more food and went back in on the 2nd to spend another at Kwai Lake. That night it started snowing. Not worried yet, I broke trail across the lake and to the edge of the drop to Murray Meadows and cut wood. The snow was up to my hips but the cabin was warm and secure. On the 4th, there was fresh snow up to my hips again; broke trail to edge; 1-1/2 hours, and across lake to cut wood. Snowing continuously. The 5th was the same again, broke trail to edge in the morning. The snow stopped falling and I headed for Croteau; 1-1/2 hours to break trail to the edge, 1-1/2 hours down and across Murray Meadows and 4 hours to wade up the hill!!! Almost stayed at Croteau on 6th but snow was firmer so made it to about mile 8 on road and camped in snow storm. Snowed 10” overnight and snowing heavily in the morning with wind. 11 hours non-stop got me to mile ½; soaked and exhausted, I pitched the tent inside the remains of the small shack. In 1-1/2 hours on Sunday, I reached the road to hitchhike home. Don Apps was passing by and vey kindly drove me all the way home. I had lost 12 pounds but had enough food for another week. If I had stayed at Kwai until the 10th, I could probably have skied out easily in a day as the thaw started late on the 7th; but, I didn’t want the humiliation of being “rescued”. I’ve had so many complaints my trips are too strenuous, that I wanted to demonstrate my values. It is my opinion that most Island mountains can be done as day trips but for social reasons, weekends are preferable. In the end I went alone. After waiting in vain til 6:30, I drove to the end of the road and headed up the hanging valley. An hour put me at the base of the headwall which proved to be an easy scramble. A reasonable pace put me on top in 3-1/2 hours. After an hour in the sun, the trip down to the crossing took 1 hour and 10 minutes. Home before supper I went swimming for a while and not feeling tired, decided to try Elkhorn. I slept in but started hiking up Elk River trail at 8:00, maintaining a reasonable pace, and arriving on top in just over 5 hours. While climbing the gulley, which was nearly clear of snow, I saw two figures heading up the Foster snow gulley and several tents at the lake. Unfortunately at this point, my boot started to come apart and by the time I got down (2 hours), the sole was half off. With different arrangements, I think Colonel Foster was probable but the boot was a good excuse as I was starting to feel tired (a bit). Next time I’ll have to try all four Comox Peaks – should take about 10 hours – later in the season. The Glacier alone is a bit too easy. Those present were me, myself, and I. The hike to the summit of Mt. McKay started by watching the rain while having breakfast at Bridie’s Restaurant. We wondered about our sanity, but no Rambler trip is ever cancelled due to rain (???????) so we climbed to the summit in the rain and snow. Visibility was great – at least 5 feet!! We hurried down to the hot soup and cider at the Haida Way to forget our insanity for at least another week. We had ideal weather for this easy scramble over rocks and small beaches near Long Beach. When we stopped to drop off some cars at Long Beach, where the hike would end, some sharp-eyed person spotted the spouting of Grey whales off the beach. We stopped for a while and soon realized that the ocean was thick with migrating Grey whales just past the surf. We not only saw spouts, but fins and backs as well. We dragged ourselves away from the whales and drove on to the trailhead at Radar Hill, which offered a spectacular view of the whole Long Beach area. We followed the trail down from the hill through dense rainforest for half an hour until we reached the sand dunes at the ocean. The route from the sand dunes alternated small sandy beaches with rocks; and where the rocks were too difficult, natural trails appeared magically in the salal wherever they were needed. We stopped often to admire the force of the waves on the rocks and in surge channels, and to examine the caves and many tidal pools filled with sealife. We were quite fortunate throughout the day to see all kinds of wildlife, including bald eagles and a colony of seals. Thus, it provided a most interesting day for all. We met for our usual early start at Smitty’s in Parksville at 9:00. After breakfast, back to Rathtrevor to pick up the tools. By 11:00 we were on the trail. John Symon had a ball clearing trail with a “bush basher” while Bob Tustin attacked Vanilla leaf with a weed eater. One o’clock Saturday took us down the trail for fish and chips then back to work by 2:30. Fortunately the girls tired quickly so we headed back for a sauna in Nanaimo. By the end of Sunday’s work, the trail was virtually clear of all obstructions up to the bridge. For years we have vowed to jack up the bridge and level it. So we did. Think of our sore backs next time you walk the trail. Remember the RAMBLERS have adopted the trail. Please use it and encourage others to do so also. Six of us, soon to be ho-dads or ho-doggers, gremmies or sand fleas, met at the junction. Bound for the waves were: Clinton Thomas, Dave Dutton, Ron Clifford, Ian Passmore, Colin White, and Bill Perry. Don and Sylvia Apps and Lynn and Laura Paterson met us there also, but were heading only as far as the cliffs and beaches. At the beach, veteran surfer Jeff Reves of Tofino gave us a talk on the history of surfing and some dry-land training. Then we took to the waves. The surf was 3 to 4 feet high and bright blue skies, warm sun and a slight breeze completed the picture. It was one of the most enjoyable days of surfing I’ve had in a long time. Four out of five new surfers got stand-up rides. All would have except that we only had four longboards, which are much easier to learn on. Among the new surfers were the elite of Port Alberni skateboarding, and they put on quite a show in the parking lot between surfing lessons. We left at about 4:30, surfed-out and sun-burned. Equipment was borrowed from Kent Fiddy’s Surf Safety School and from several local surfers. Their help solved a major problem in planning this trip. I hope we can do this again some time. Driving north on logging roads from Pt. Alberni, you come to a large sign “Strathcona Park”. 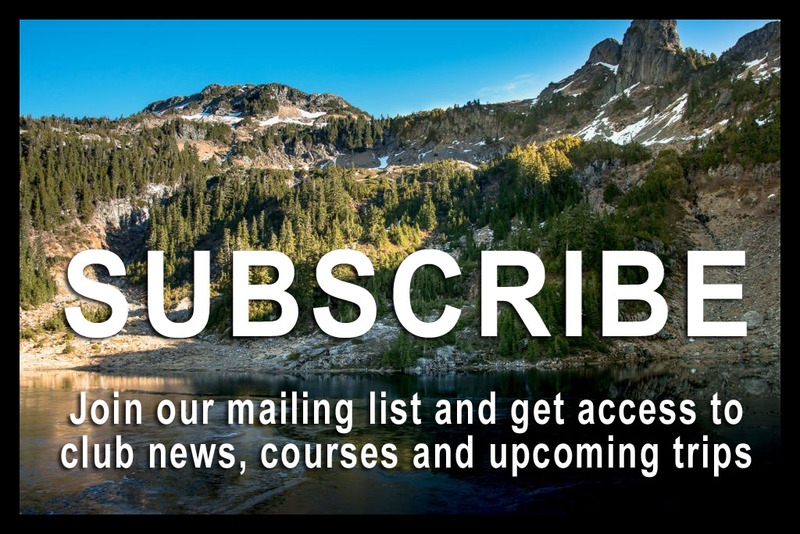 There isn’t any other way you’d know, because logging continues all the way, right to and including the east side of Oshinow Lake, where logging is proceeding with its usual environmental finesse on the steep slopes where recovery will be slow. Four canoes set out in nice weather from the parking area at the south end of Oshinow Lake. Don Apps and Ruth Masters, Leaders; Herb Warren with his ladies, Rosemary Shirley and Lois Hubert, Eve Howen and Pam from Victoria, and Pat Joyce and Jan from Nanaimo, the latter having made her own beautiful 17’ cedar lath canoe. A four mile paddle up to the head of Oshinow Lake and about a mile back-pack up the Ash River brought us to a lovely gravel bar for camp. Taking a canoe up would be difficult since there are about a quarter of a mile of rapids at the start. George and Anne Compton arrived as we set up camp. There’s a lovely large sub-alpine meadow nearby, resembling Paradise Meadows, with nice flowers. Next day, Don Apps led us easterly through the gap to Puntledge Lake, a pleasant, muddy little lake which drains east into the Puntledge. Don and small party followed the Puntledge down into the valley and found a good route for the proposed valley trail which will go up from Forbush Lake to Puntledge Lake, through to Ash River, then Margaret Lake to link up with the Price Creek Trail, south of Buttle Lake, for a valley trail system in the Park. We could use volunteers with snippers, mattocks, and chain saws on CDMC work parties, to get these routes in and marked. Personally, I think the salad days of this club were in the late 1960’s as we toiled away on the Marble Meadows Trail. If it is club cohesion and interest you are seeking, then work parties are a good place to start. Bob and I arrived at the Parks Branch around 9:00, and decided not to cross the lake until morning and so headed to Buttle Lake Campsite. The only vacant campsite contained a bear trap – but, we took it anyway!!!! The next morning Bob and I headed across the lake in our canoes. On the other side we had lunch then lay in the sun. While sunning, we spotted a car near our cars and headed across to investigate. We carried Francine and pack back across the lake, drank some tea and coffee, then headed back across the lake, once more, with Bob’s canoe in tow. Camp was set up by 6:00, at which time Robert prepared Beef Tetrazini. We started off to the caves at the crack of 10:30, arriving there in time for lunch. After about 10 minutes in the cave, we returned to camp, broke camp and headed back across the lake. Bob and I headed to Gold River for dinner and the Captain Cook play (which was cancelled as it conflicted with the weekly show). We then headed off for the Elk River Trail, car camping at the trailhead. Monday saw us on the trail shortly after sunrise. We met the C.D.M.C. as they headed out and a very embarrassed “student of echoes” (he drives PSJ-010) who let off some dynamite in Landslide Lake. After a few minutes at the lake, we strolled back down the trail and then on to the “D.I.” for dinner and cheesecake. The original goal of this weekend was Mt. Rainier, but due to a lack of interest resulting in too small a party for Rainier, the idea was cancelled and Shuksan chosen instead. Saturday morning, we drove through the border crossing at Sumas, Washington and on to the ski area where we got one of the last parking spots. We hiked an easy 5 miles to Lake Anne on typical National Park super-highway! The rest of the day was spent watching two parties on the mountain going very slow. They disappeared from the skyline 4600’ above us to appear briefly on the Upper Curtis glacier but then vanished for hours in a maze of spurs, gullies, and buttresses. We wondered what was going on on that rock face. They finally came in to camp one by one, dead beat but saying it was a very enjoyable climb. The next morning, our worries were put aside when we found it was a pleasant scramble to the summit; a mixture of rock and snow with good snow conditions on the somewhat broken glacier. The route took us along the west side of the Lower Curtis glacier (all on rock) to the Upper Curtis. We roped up at the top of the gullies and crossed the Upper Glacier. After walking up the Hourglass and a pleasant scramble up the summit pinnacle, we reached the top after 4600’ and 5 hours of climbing (10:00 A.M.) The summit, being 9127’ elevation, gave a good view of the whole Cascades, always dominated by Mt. Baker looming barely 10 miles away. After dodging the rocks showered down by a climbing school party, Mike and I loafed our way back down to camp in the beautiful sunshine. Bob and Tom had long since shot on ahead. We then had a windy nights sleep and packed out the next morning, drove back to Canada and home. Due to the early arrival of the monsoon season and 36 hours of boredom in tents, we called it quits after 3 days. Rambler Peak was climbed and a PVC register implanted in the summit cairn. We met at Ralph River boat launch about 12:30 Saturday morning, crossed the lake after a short sleep, then up to the Meadow in steady drizzle. On top the rain stopped and clouds parted as we burned garbage at the cabin. Sunday was spent wandering the marble beds until the 4:30 P.M. downpour tented us until morning. After several cups of coffee, we headed down the trail to the lake and on to the Driftwood for lunch. I apologize for the difference in print quality but my machine was fixed and adjusted in the middle of printing. Thanks to those who contributed material, this is a little thicker than the last one! I hope the reports keep coming in and that you send in any comments pertaining to the TT. Have a good winter! This trip got away from the meeting place about an hour and a quarter later than scheduled because I had not been checking the schedule properly. When only one group phoned to say they were coming, we thought it better to meet an hour later. However, I did check the schedule later and realized there might be complications, so I scurried on down to the meeting place and found Brian waiting there; another couple arriving shortly after. We drove off to a nearby cafe to have coffee and kill time. The rest of the gang were at the meeting place when we got back. We drove about 2.8 miles up the mountain, left the cars, and hiked up a road which eventually gave us a good view of the Cowichan Valley, Lake Cowichan and the surrounding area. A little farther on we came to the old Manganese mine, which probably operated about 64 years ago. When I came to the Island to live permanently in 1946, there were still two wooden towers atop the mountain. They were used to support the aerial tramway, transporting the ore down to the railroad in the valley. After a brief look around the old quarry, some discussion regarding the use of manganese, and how the rosy pink rock, known as Rhodonite, is probably of more value as a lapidary stone than as manganese ore, we climbed to the open rock bluff above the mine and had our lunch. This spot provides the best view to be had on this side of the mountain. After lunch, we headed through the bush to a road that took us to another Rhodonite outcropping. Many of the party seemed quite interested in the stone and since there was little that could be picked up, I asked them all to stop by at my home when the trip was over and pick up samples of the slabbed rock. This file was originally mailed to the members of the Island Mountain Ramblers, in 1977. This file was originally mailed to the members of the Island Mountain Ramblers, in 1976. It includes trip reports and club activity between December 1975 and May 1976. This file is a scanned from documents that were originally mailed to the members of the Island Mountain Ramblers, in 1975. 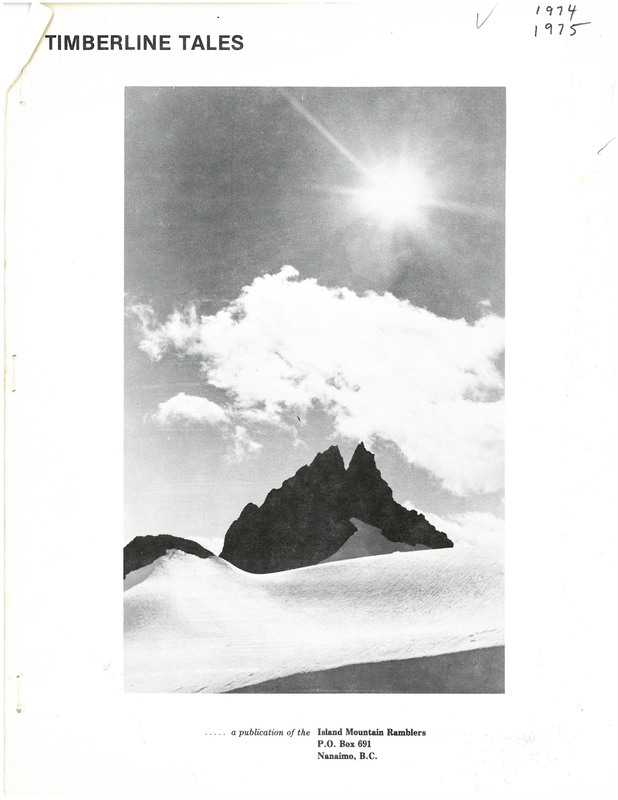 It contains trip reports, club business, and information about the Federation of Mountain Clubs of British Columbia (FMCBC) written from December 1973 to August 1975. This file was originally mailed to the members of the Island Mountain Ramblers, in October 1973. This file was originally mailed to the members of the Island Mountain Ramblers, in 1973. This file was originally mailed to the members of the Island Mountain Ramblers, in January 1972.